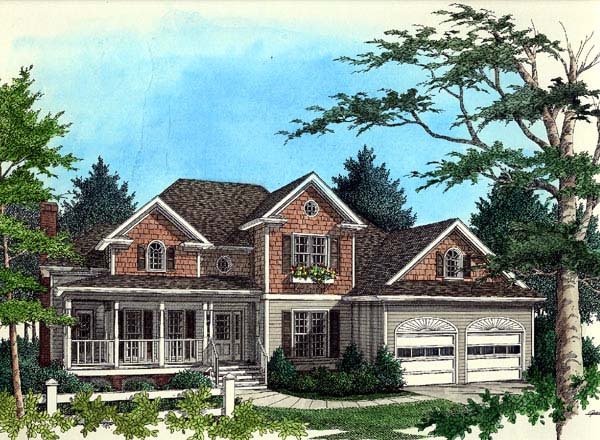 This delightful 1-1/2 story farmhouse design has a siding exterior accented with wood shingles, a window planter, and brick veneer foundation. The master suite is conveniently located on the main level. It's inviting wrap-around front porch makes this home irresistible. To the right of the entry is the dining room and to the left, the living room, featuring an 18' high vaulted ceiling with a radius top window and decorative columns crowned with a plant shelf. Just beyond is the large family room also with 18' high vaulted ceilings radius top windows which provides extra sunlight and accent the built-in bookcases. Double French doors lead to the spacious deck. The kitchen has an abundance of cabinets with a breakfast bar open to the family and breakfast rooms. The luxurious master suite boasts a tray ceiling, his & hers walk-in closets, and a dramatic bath with a whirlpool tub and separate vanities. A powder room and laundry room with laundry tub complete this level. Lower level rooms without vaults or trays have 9' ceilings. Upstairs, the secondary bedrooms share a compartmentalized bath and each has a walk-in closet. The bonus room provides additional space for a play room, home office, or 4th bedroom. All upper level rooms have 8' ceilings.